Here is a chronology of transfer fees paid and received for Southend United players. 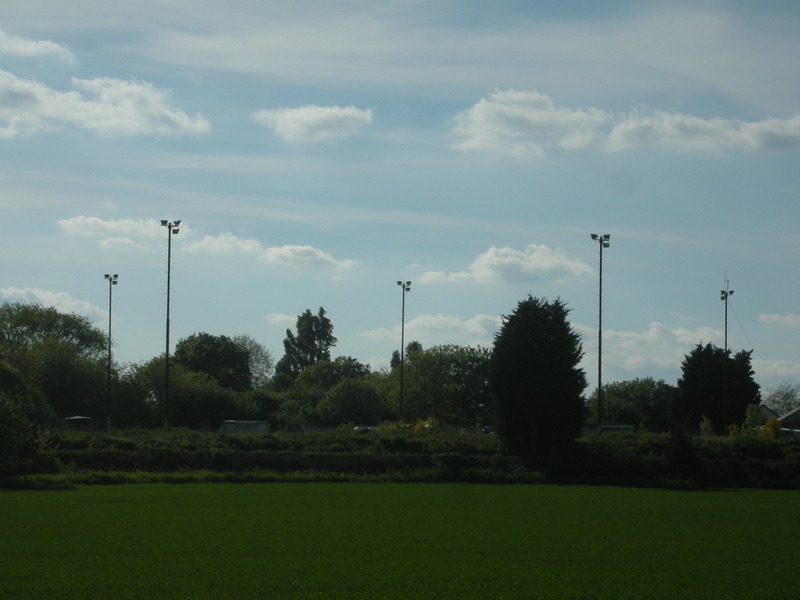 The disappearance from the football scene in the mid 1990’s of Collier Row Football Club could almost pass unnoticed but one remarkable remnant of their 67 year history. Their Sungate ground, home since 1948, still exists not only dormant and unloved but actually buried lock, stock and barrel under thousands of tonnes of landfill like some modern day sporting equivalent of Herculaneum. Collier Row was originally a small village which like many would be swallowed up in the untamed urban sprawl that is now called Metropolitan Essex. The football club formed in 1929 as a team called Hamden United and were called Collier Row Motor Gear as recently as 1980. 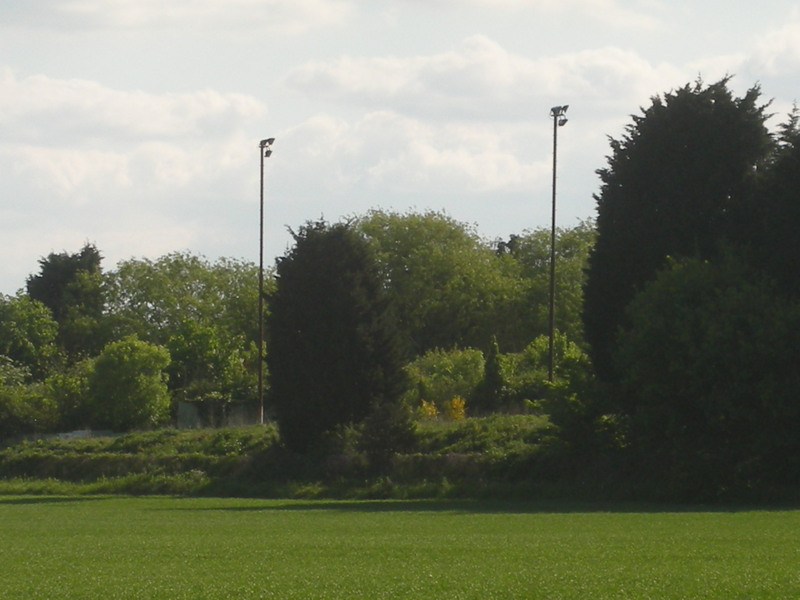 The club had originally played at the nearby White Hart Lane before securing a patch of land in the adjoining road, Collier Row Road. 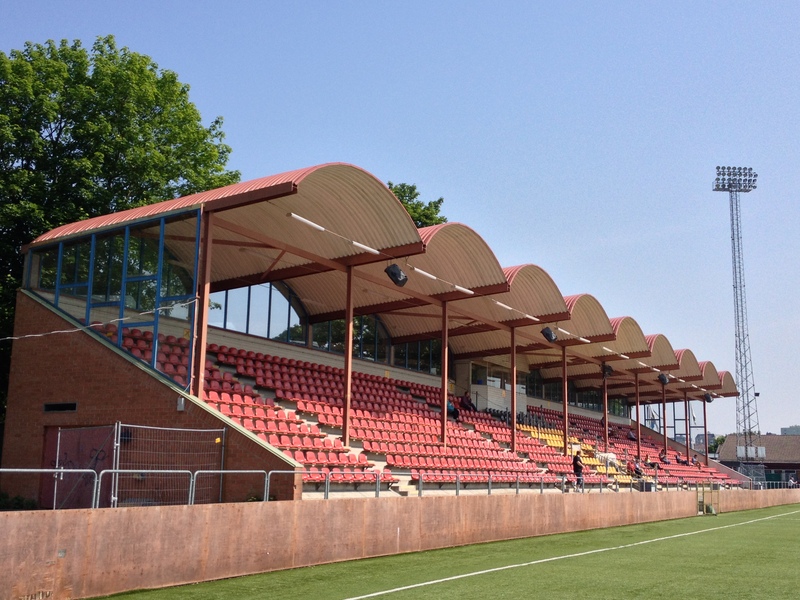 The ground developed, particularly in the 1970’s when a large clubhouse was opened and sat proudly above pitch level. 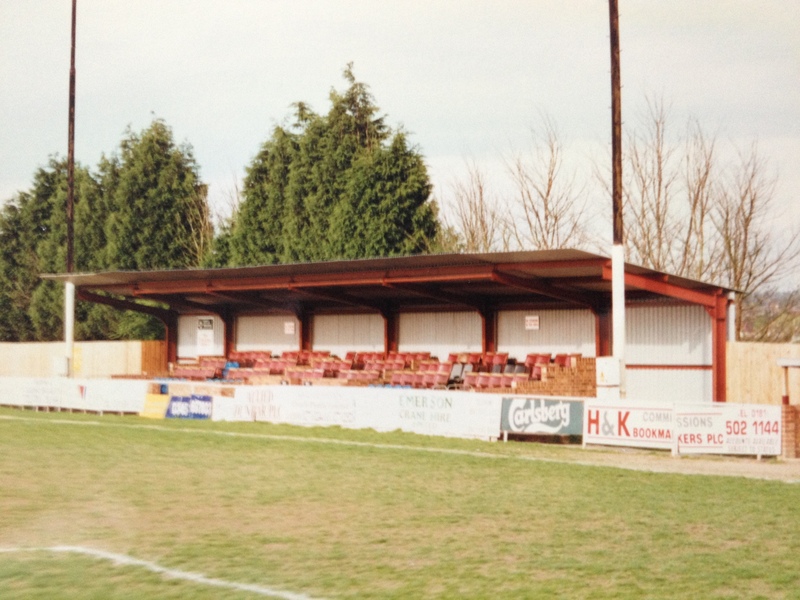 Long before the new millenium purge of ground grading and uniformity a small covered stand was erected with comfy padded seats rescued from Butlin’s in Clacton. Legend would say that in turn Butlin’s had acquired the seats from the ocean liner the Queen Mary. Provenance was never established although their antiquity was undoubted. In the 1970’s the club gained no little infamy for the employment of a notoriously ill-tempered billy goat to keep the pitch in check. After a butting incident too many the committee voted on more traditional mowing methods for the Sungate surface. 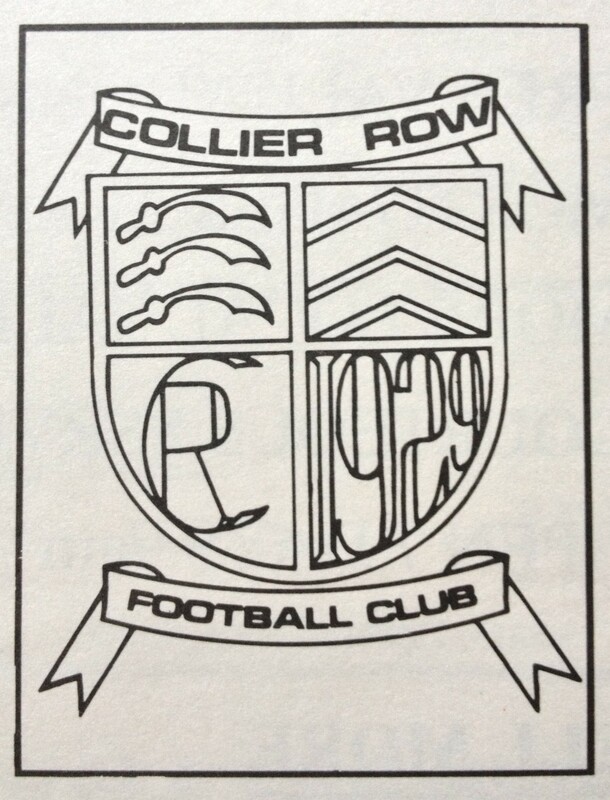 Collier Row had progressed nicely if somewhat sedately through the Essex Olympian and London Spartan Leagues before gaining promotion to the Isthmian League in 1986. Promotion to Division One in their second season was to proved their finest hour as the club flitted between the Second and Third Divisions on a regular basis. What proved to be their final season as a single entity however, 1995/96, saw the Row finish in a creditable fifth place in Division Two. Meanwhile some four years earlier a reformation of the old Romford Football Club had seen them competing in the Essex Senior League groundsharing initially at Hornchurch’s Bridge Avenue before spending the 1995/96 campaign at Ford United’s Rush Green Road ground. Amid rumours of skullduggery and a hostile take over, Romford moved into Sungate and join forces as Collier Row and Romford. Initially the move seemed mutually beneficial as the amalgamated clubs won the Division Two title ahead of runners-up Leatherhead. However, the nature of the merger became wholly apparent the following season when Collier Row was dropped from the amalgamated name and disappeared altogether. By 2001 the ground had been sold and the Romford club continued on their nomadic ways via Ford United, Aveley and most recently Thurrock. 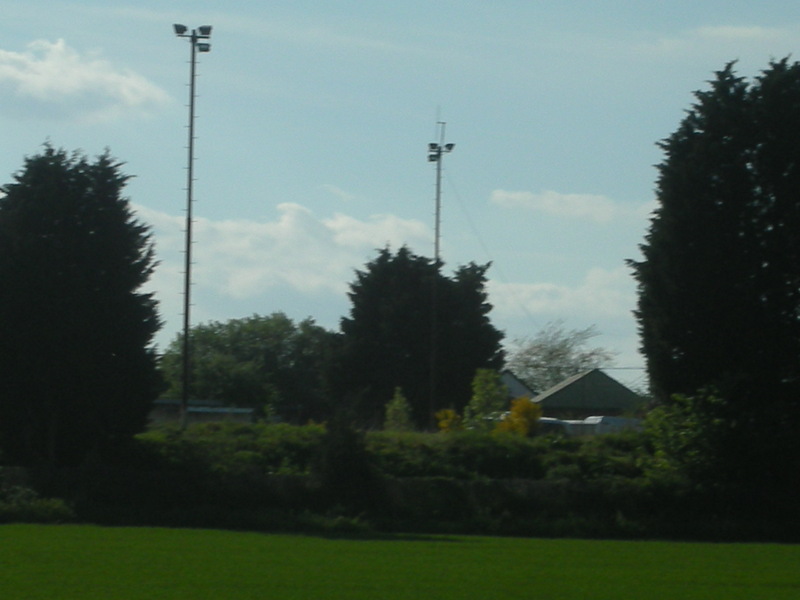 This despite being granted planning permission in 2009 for a new ground of their own on Westlands Playing Fields in London Road. So what of Sungate? In this densely populated area one would assume it had been sold off for redevelopment as affordable housing, but an altogether more unusual demise awaited. 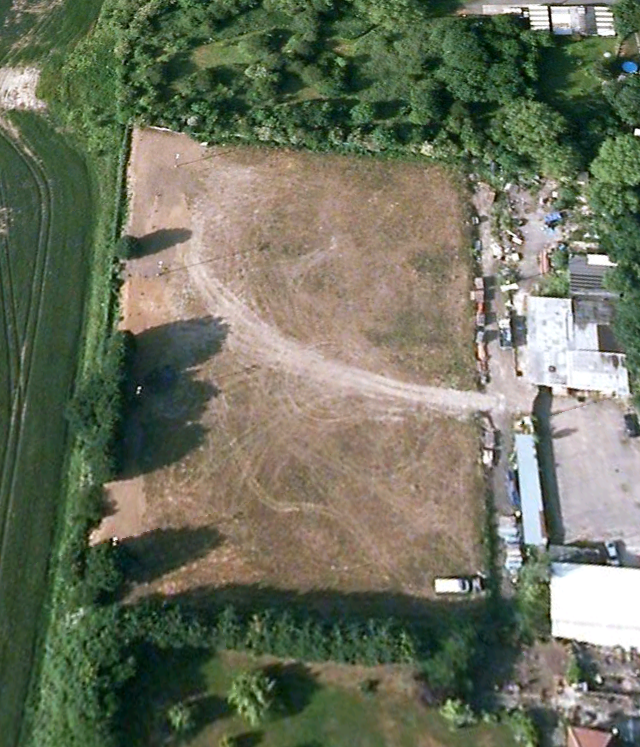 Sungate had a strange location, open fields and beech trees to the north, south and east would be the antithesis of the west aspect which was tightly hemmed in by a garage, a café and a garden centre. The illusive owner refused to listen to any potential new tenants, the perennially nomadic Eton Manor were one interested party, and promptly locked the ground up for good. Seeking to make money from new landfill and environmental charges the owner allowed tipping onto the site at an incredible rate. The low slung stand and clubhouse now lie under the current surface of the landfill, although the clubhouse roof can still be made out. 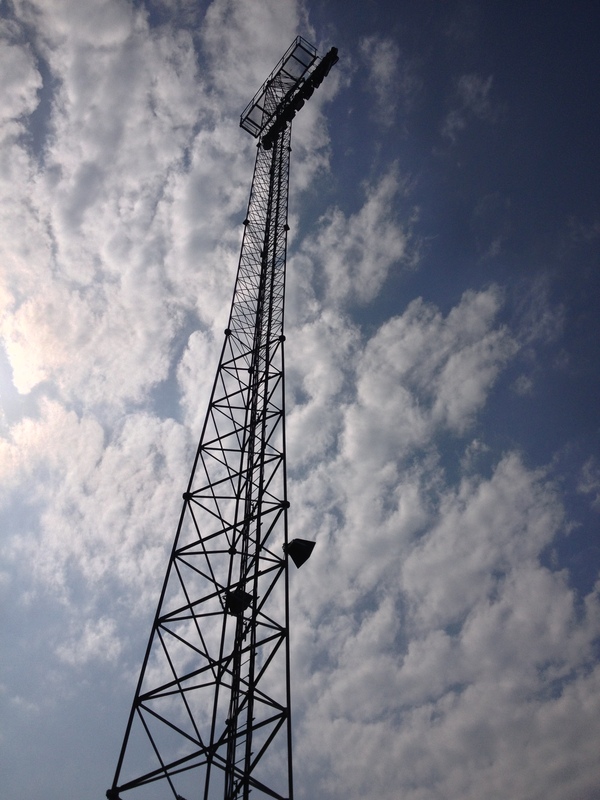 The rusting collection of still erect floodlight pylons gives a clear orientation to the pitch that lies beneath. 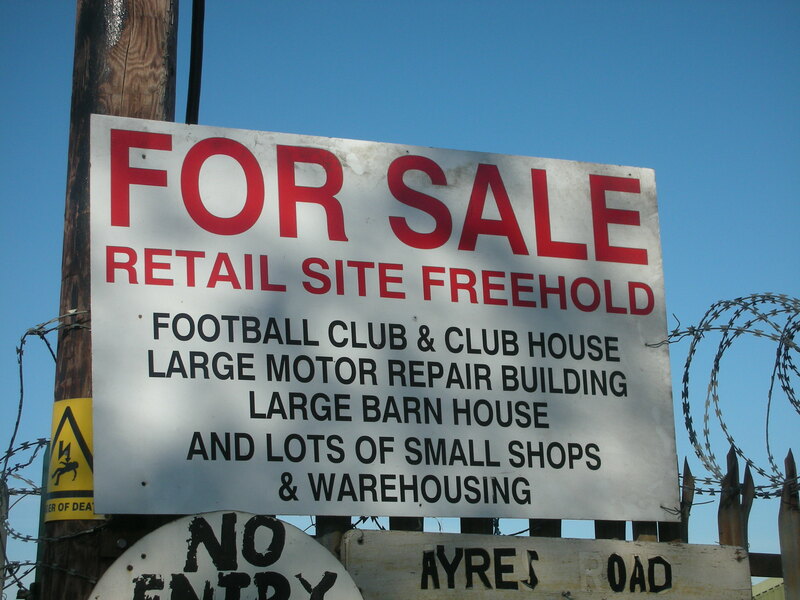 So there in lies the dilemma, a belligerent owner and a football ground that is now surely too costly to clear and return to active use. One can only wonder what future archaeologists will make when they uncover this most unique burial ground. 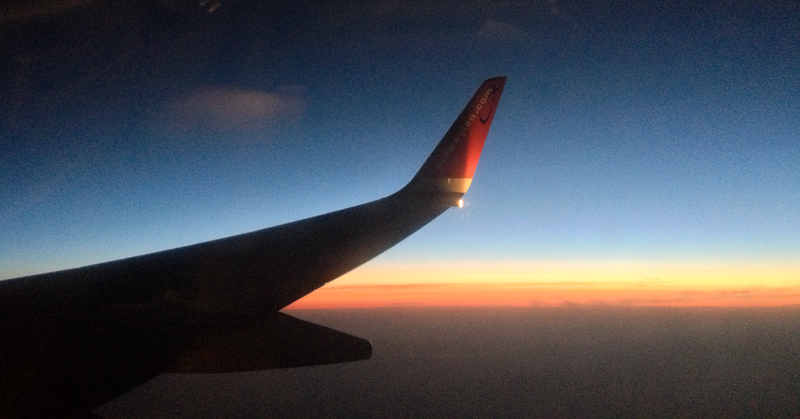 Sweden has become a favoured haunt of mine in the last few years, ostensibly the excellent Swedish Groundhops and some independent trips have made the northern kingdom a place I love to return to. This year’s hop takes in the central province of Uppland and means flying into the behemoth that is Stockholm’s Arlanda airport. 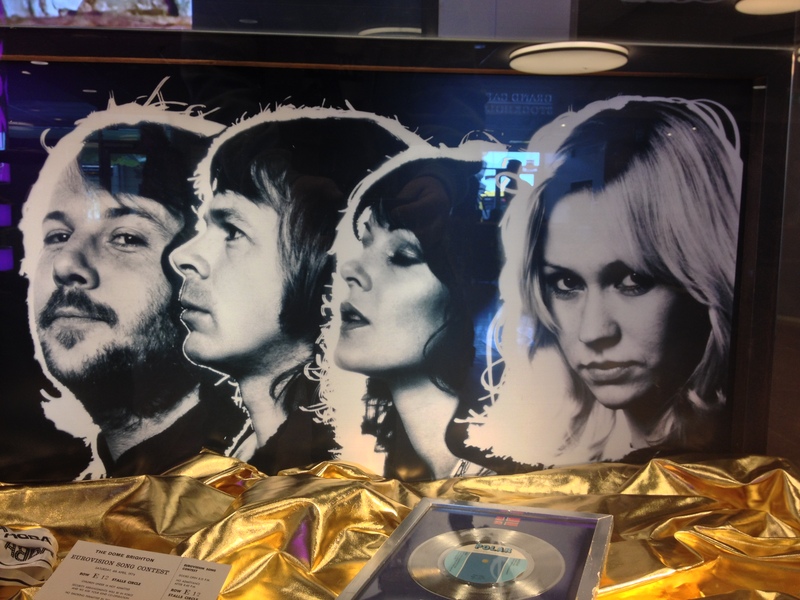 Now promoting itself as the “official” airport of the new ABBA museum, it is interesting to note that the global phenomenon of ABBA has now belatedly been recognised in their homeland. 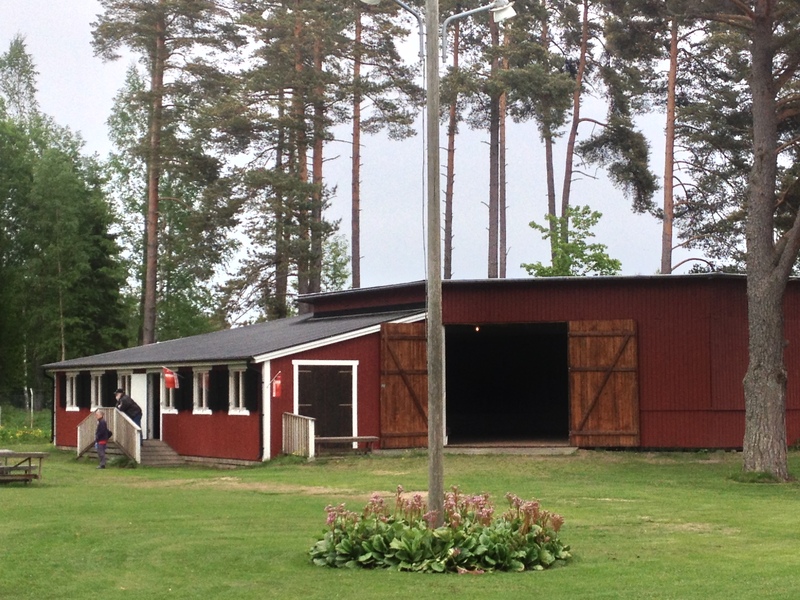 A quick punt up the motorway sees the merry band gather at the small village of Månkarbo for game one of this year’s festivities. 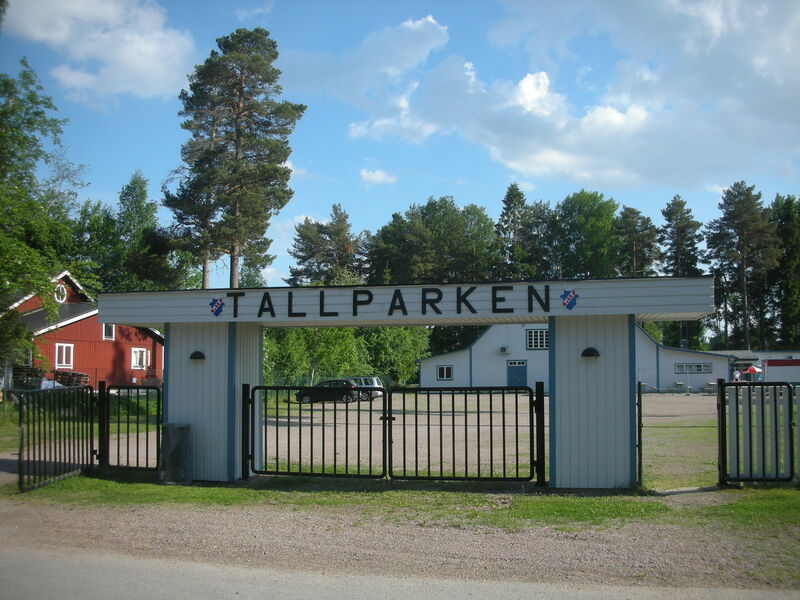 The village numbers a mere 660 inhabitants most of them turn up to the photogenic Tallparken to see the game, a live band in the clubhouse and to look at the odd band of British travellers pitching up in their little village. Publicity for the eccentric British travellers has gathered momentum in recent years. 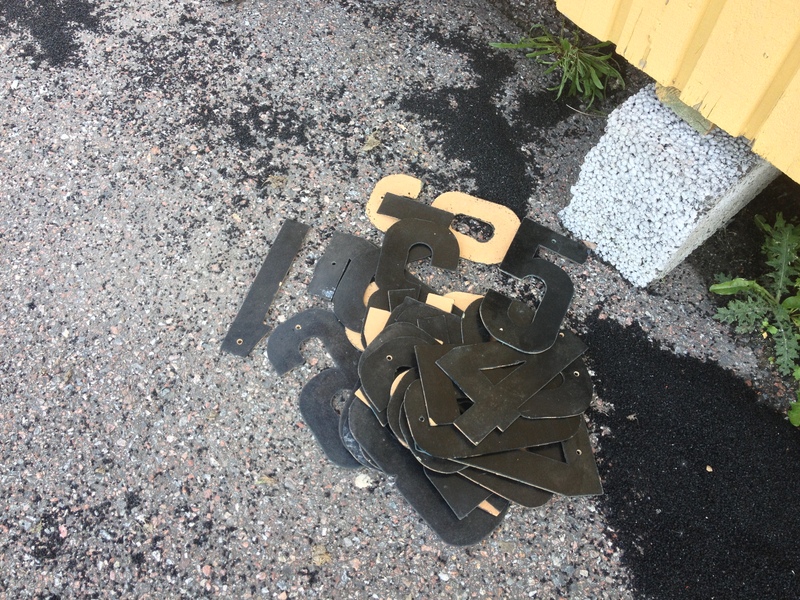 Only last year we were followed by Offside magazine, the Swedish equivalent of 4-4-2, who managed to pack thirteen pages of their weighty tome to the why’s and wherefore’s of this quirky activity. This year Swedish television gets into the gathering and films organisers Kim Hedwall and Laurence Reade plus the irrepressible tour-de-force that is the legendary Martin Bamforth to explain this curious pilgrimage to a welcoming and intrigued nation. 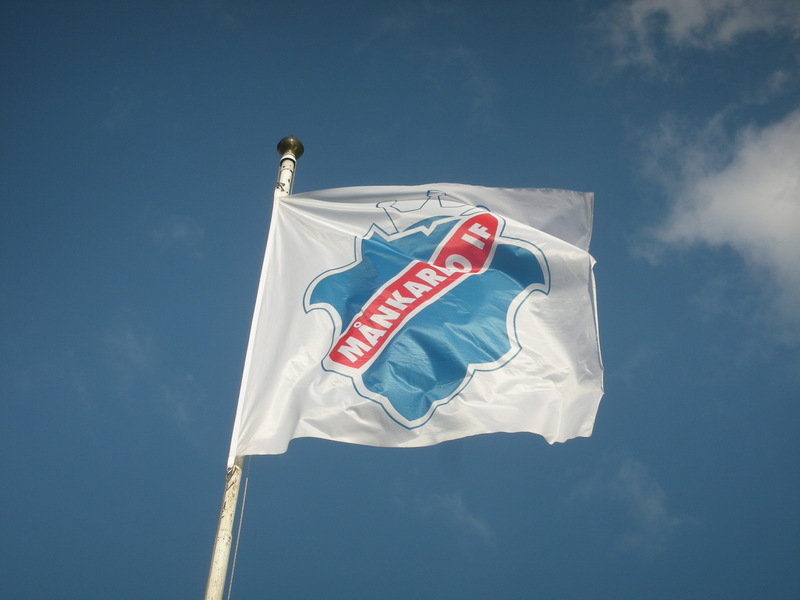 Månkarbo’s welcome is first class, a tasty snack and a beer are awaiting us and we are deluged with gifts including shirts and badges. As the game ends in a comfortable 4-0 win for the home side against their mortal enemies Karlsholms, a rock covers band “Just Got Paid” strike up to ensure the villagers enjoy this evening out together into the small hours. Saturday brings disastrous news for any groundhop organiser, the visiting team for the first game cannot raise a side, even though the season is only half a dozen games old. 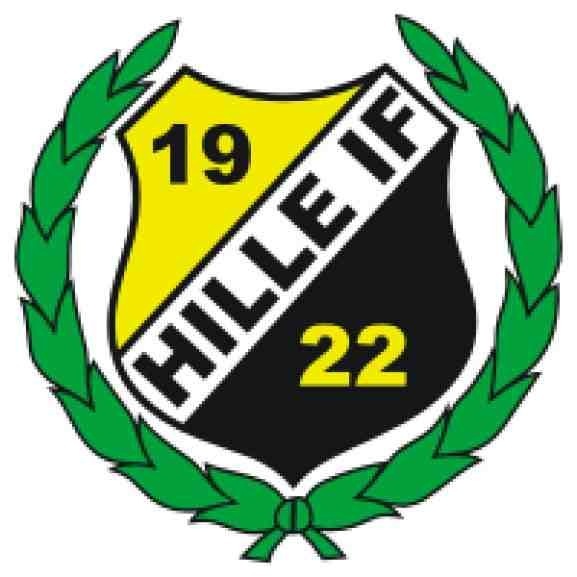 There is great sympathy for Gävle GIK, the hosts, whose efforts are in vain. The quick thinking and knowledgeable Kim Hedwall goes into overdrive and is determined to pull a rabbit out of his hat with next to no margin for error. 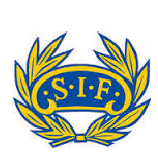 The beneficiaries are Storviks AIF a new offshoot of the existing Storviks IF club. The coach rounds a corner and a collective sigh of relief confirms Kim has sorted out a more than adequate replacement. The hosts have hurriedly cobbled together a programme and some coffee and cakes for their unexpected guests. 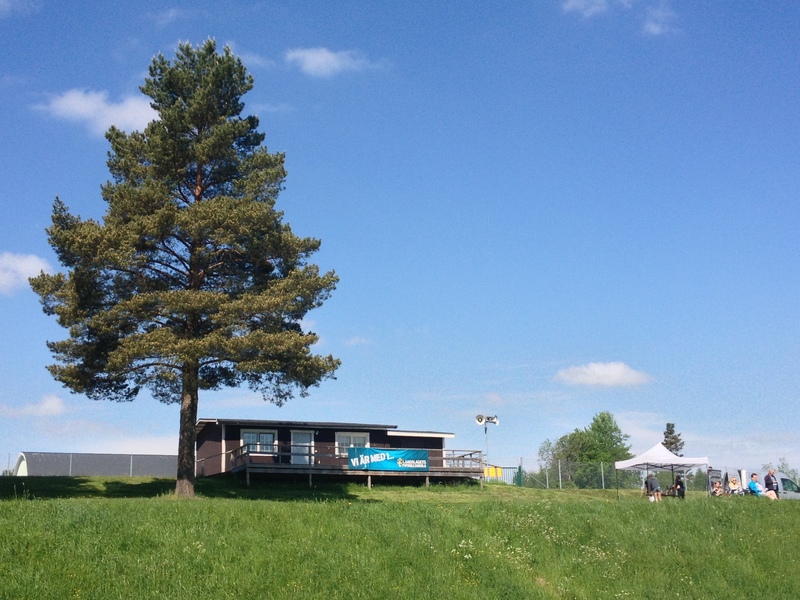 Their hospitality is greatly appreciated and the match is viewed from a steep bank in warm sunshine. Storviks’ hospitality doesn’t extend to their opponents Lingbo, however, as the new boys give the visitors a master class in finishing and win 4-1. 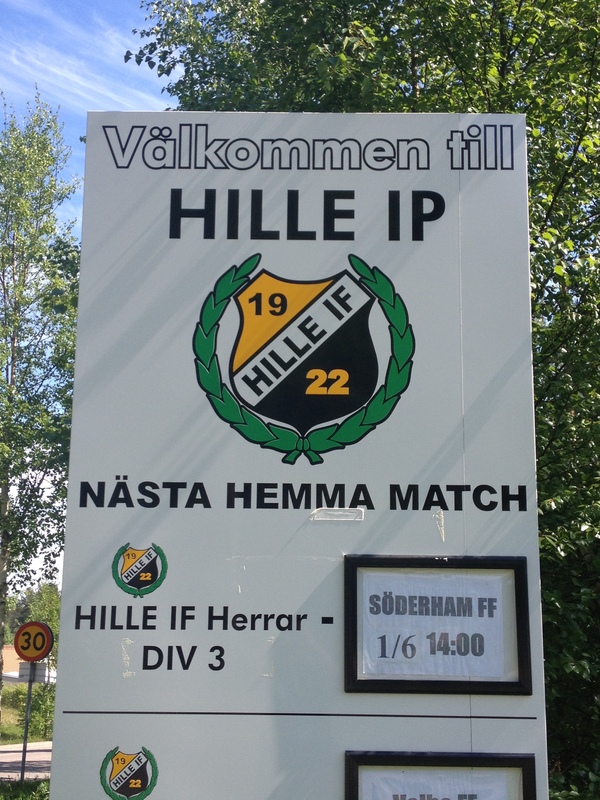 Next stop is the sundrenched Hille Idrottsplats for a top of the table clash. Another warm welcome, coffee, cakes and gifts as well as informative talk from a rightly proud chairman. It’s a tense affair which the homesters win by a solitary goal. 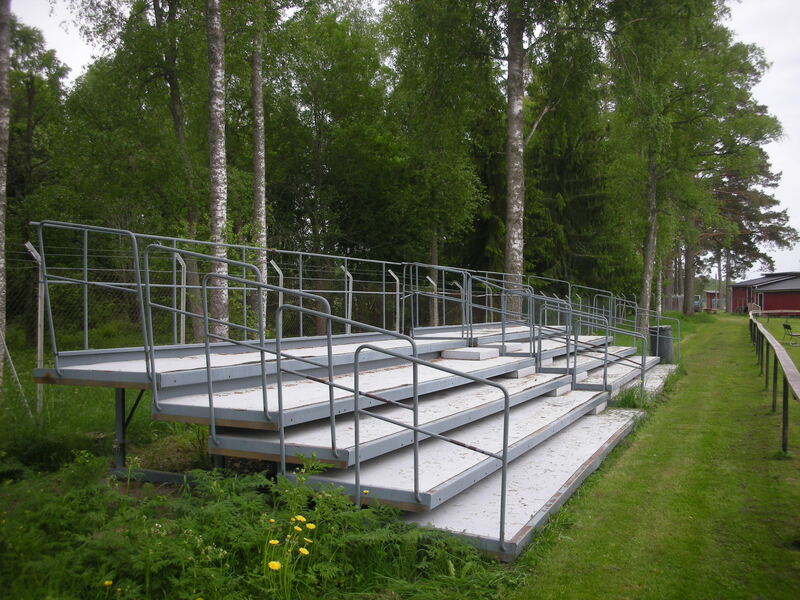 The ground has traditional bleacher style seating and the game is very well attended. The kiosk selling cold drinks and ice cream does a roaring trade as the crowd swelters in searing heat. 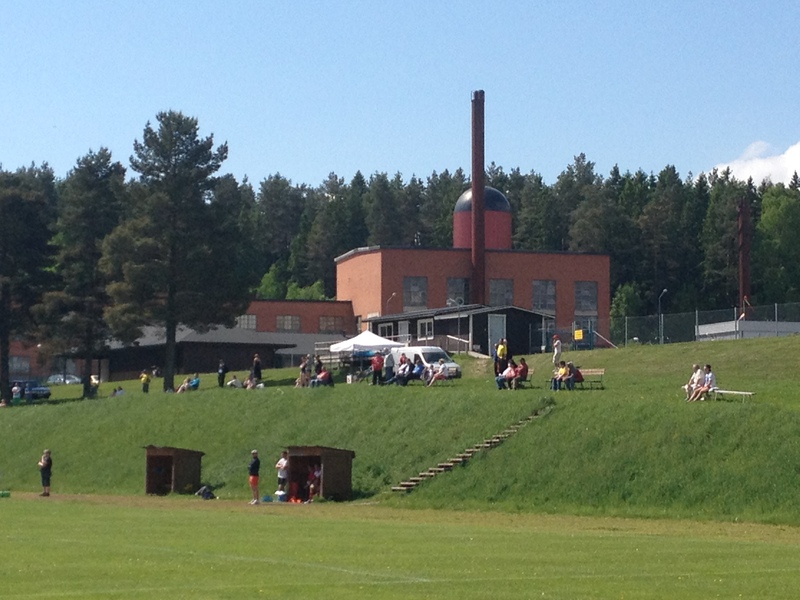 The third game of the day is literally in the middle of nowhere at Strömsbergs IF. In a move akin to Bishops Stortford’s enforced placement in the Conference North, the hosts have found themselves launched into the north division of Division Two (fourth tier). 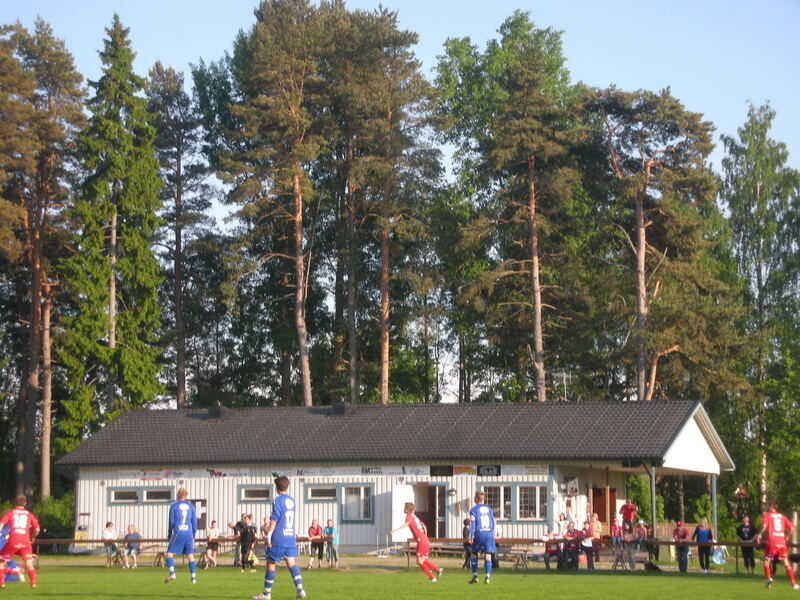 Opponents Skellefteå are over 400 miles away and have taken eight hours to drive to the ground. To say the hosts are unhappy with their journeys is an understatement. The ground is a bit of beauty, an extraordinary clubhouse, circular in shape for dancing from the adjacent bandstand, is a real treasure and also has a timeline exhibition celebrating the club’s centenary. The game is turned on a debatable penalty decision and the home side overcome their understandably lethargic visitors. Saturday night concludes with a hunt for food in a strangely quiet Uppsala Gamla Stan. The highlight of the bus ride back to the hotel is an elderly local couple spotting Martin Bamforth as an inadvertent star of the previous night’s news programme on television. 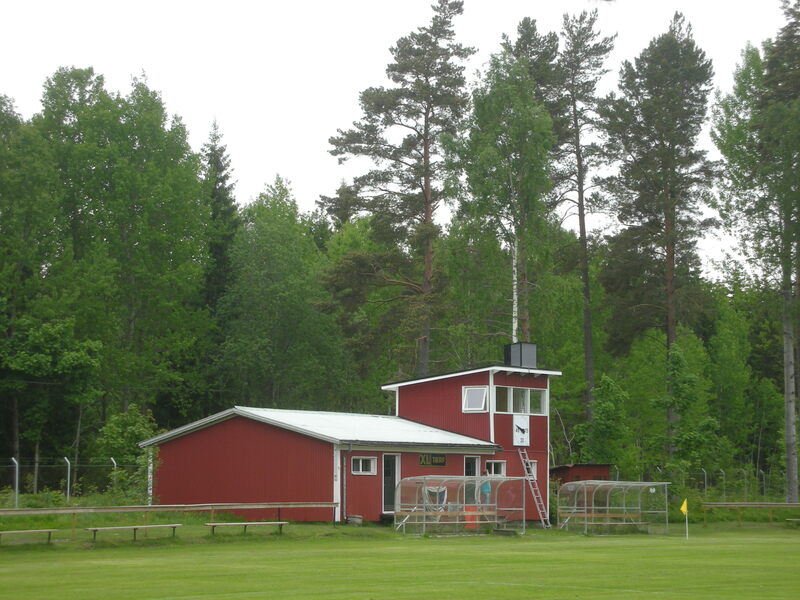 Sunday sees a drive back to Stockholm for a game at multi pitch Skytteholms. 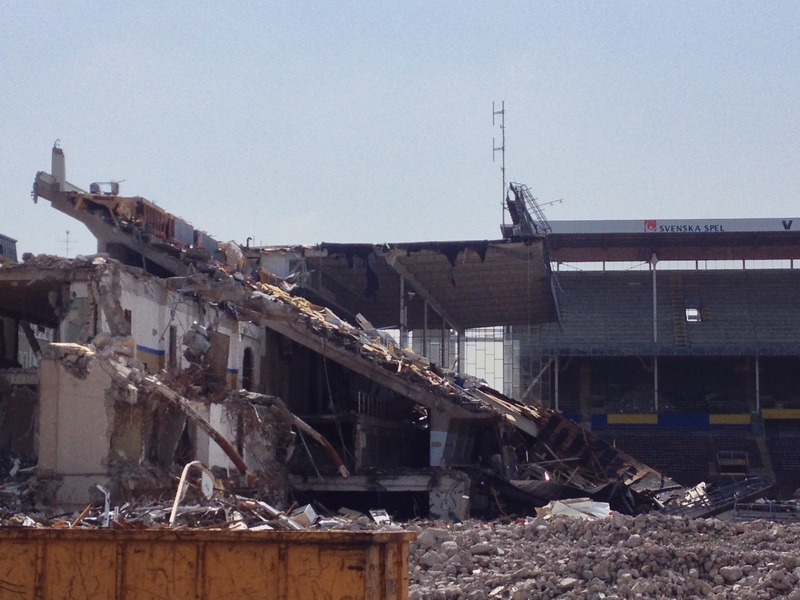 With time on our side for once, some take the option to look at the part demolished old national stadium, the Råsunda, over the road. I find the scenes of devastation quite harrowing, one of FIFA’s official iconic football grounds looks more like a warzone. The need to finance the new Friends Arena is undoubted but what a price to pay for it. 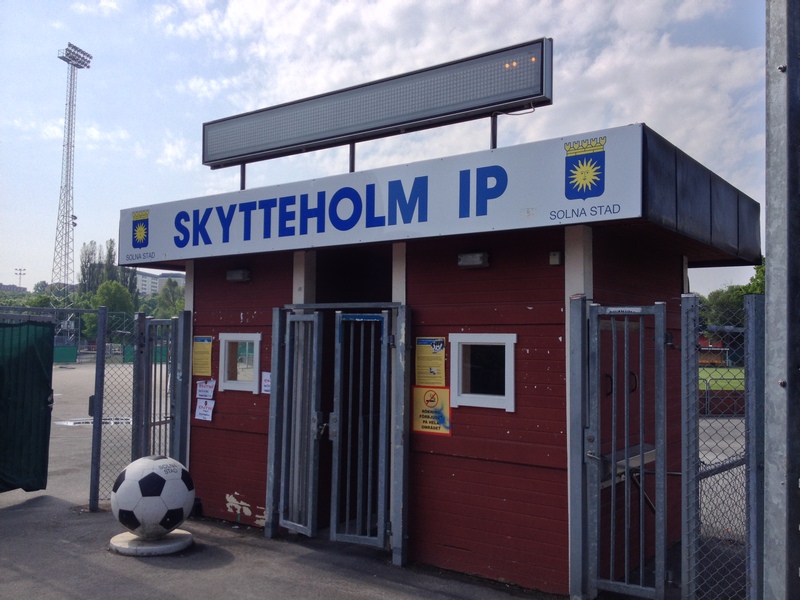 Skytteholm is principally the home to Vasalunds IF who have in the recent past had a brief flirtation with the second tier of Swedish football, the Superettan. 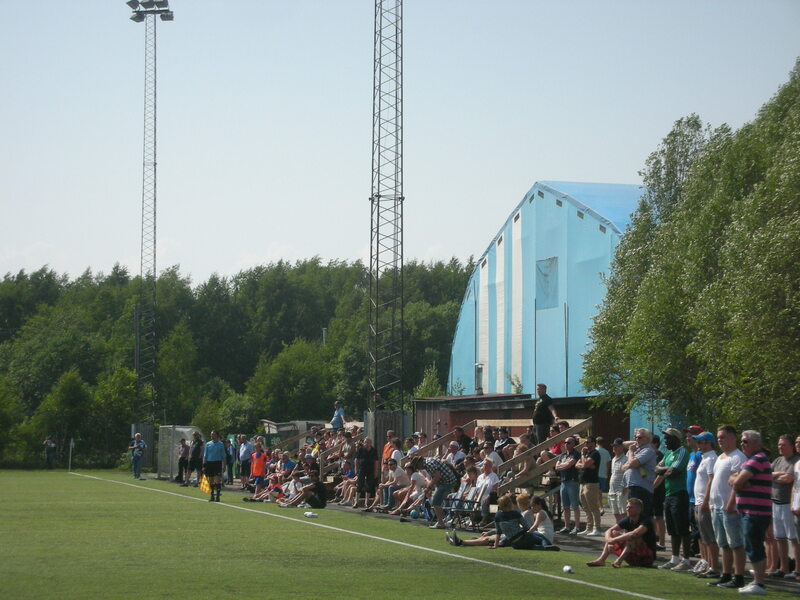 The 4G pitch, however, with its astonishingly tall floodlights, is used morning, noon and night by a number of clubs and also AIK’s youth teams. 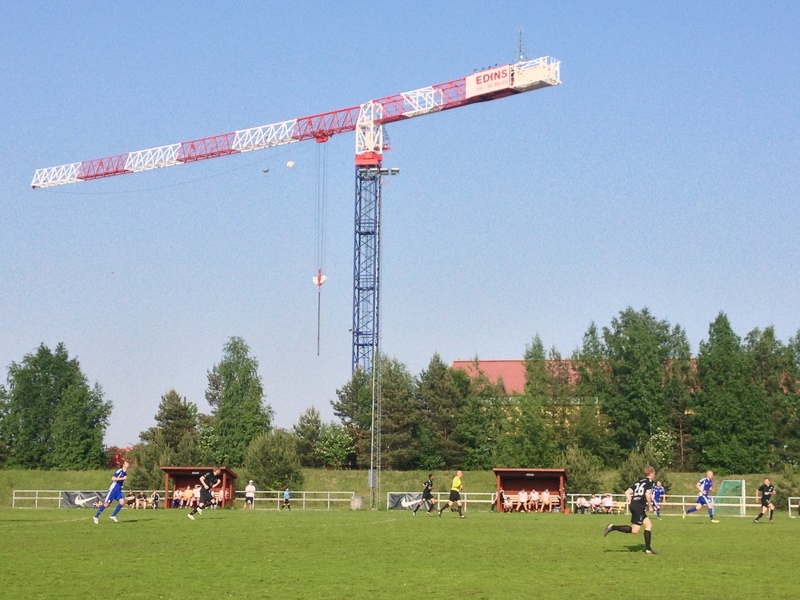 This morning it’s Third Division Athletic FC, a team from Stockholm’s ever burgeoning émigré populace that are playing host to footballing travellers of a different sort. 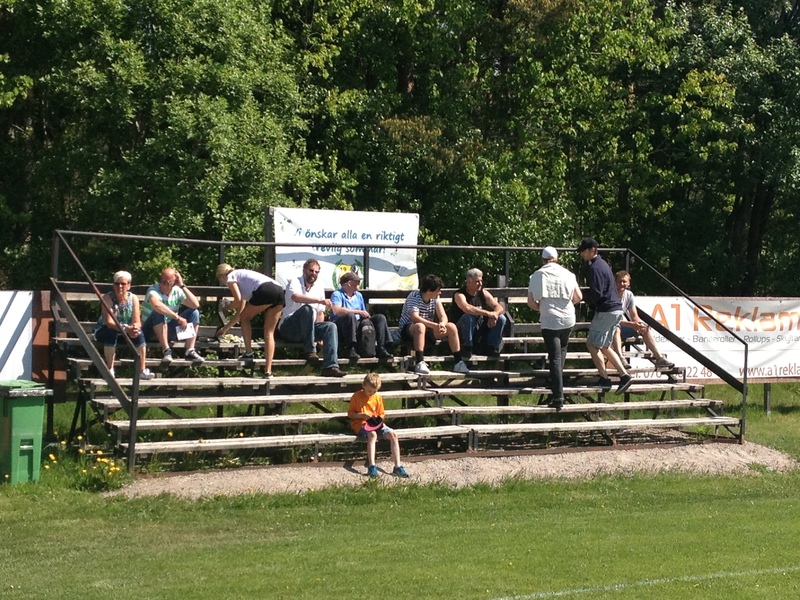 A quick sprint over to Åkersberga, familiar from a visit to the town’s other ground in 2011, sees the party arrive at IFK Österåker. Yet another cordial welcome and a definite winner in the gift bag stakes (the socks will come in handy next winter), and we are ready for another top of the table clash. 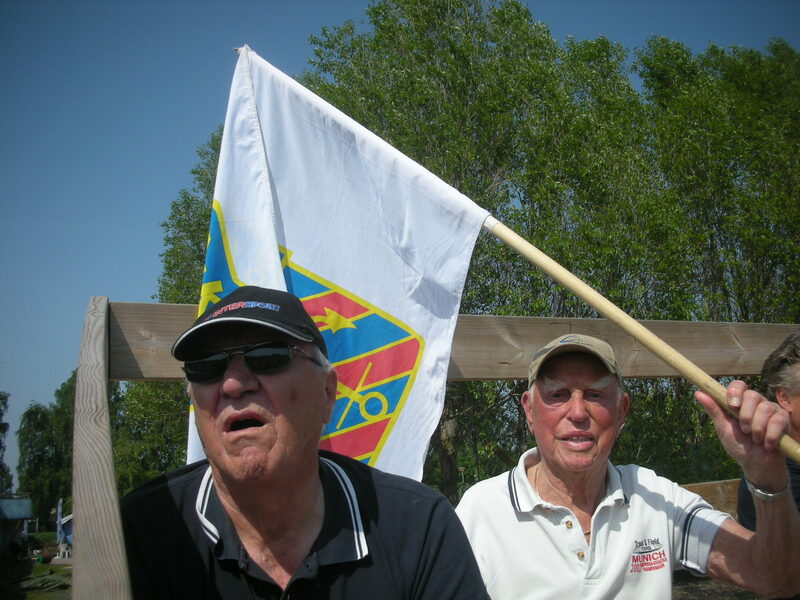 The visitors are hot favourites for the title and have brought some supporters with them, including an ageing pair of flag waving “ultras”! 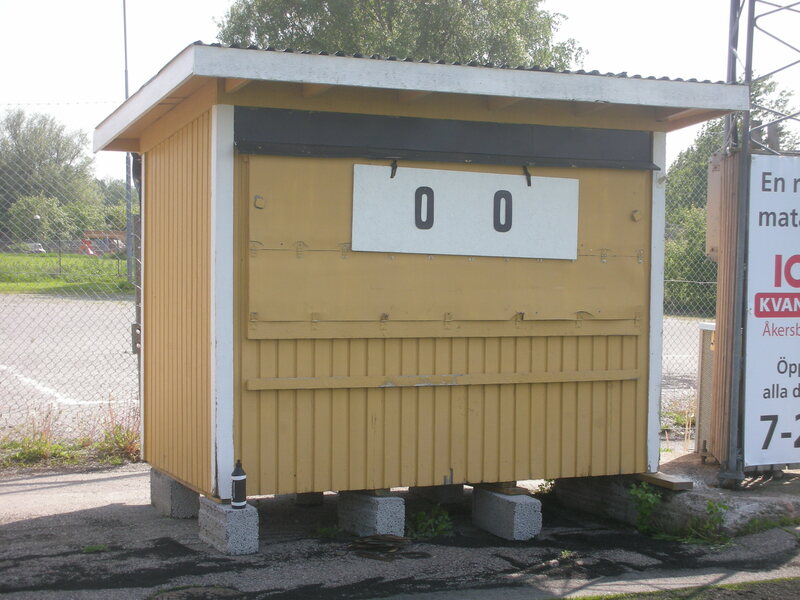 The home side wilt in the heat and the lovely old manual scoreboard records, in the end, a comfortable away win. 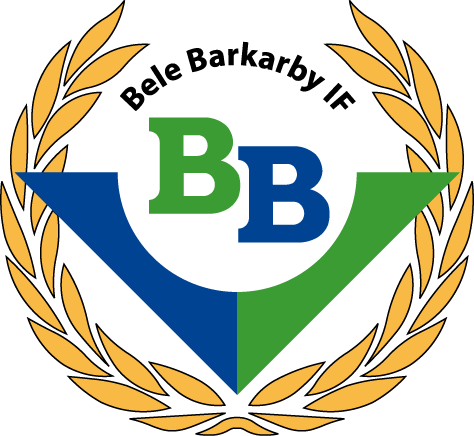 The final game is at the curiously named Bele Barkarby. 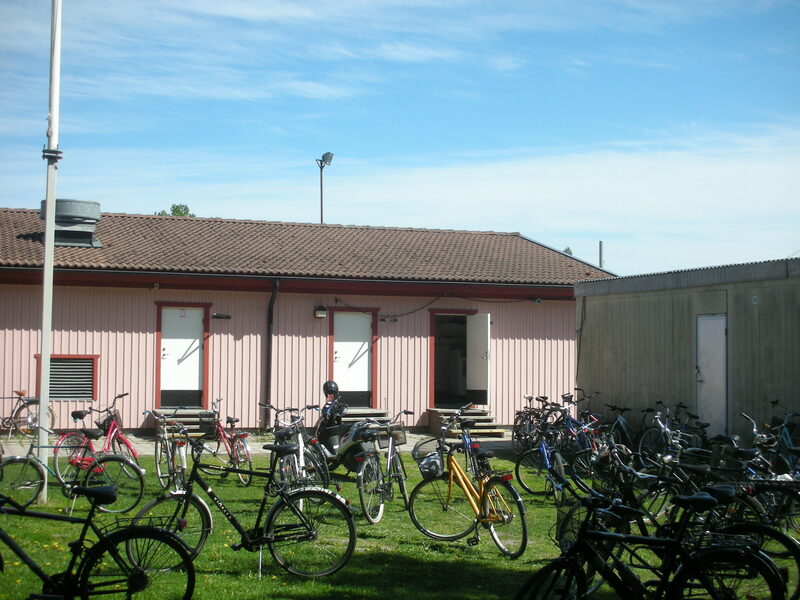 It’s a busy scene that greats us as multiple teams and age groups use the facilities. The Veddestavallen is not a photographers dream being situated in an industrial area and the undulating pitch is the talk of the pre match build up. The hosts go to town providing us with glossy reading material and they are clearly proud of their self funded progress. The game is a curious event, a goalless and tight first half is the antithesis of the second, when the hosts rattle in three quick goals to put the result beyond any doubt. 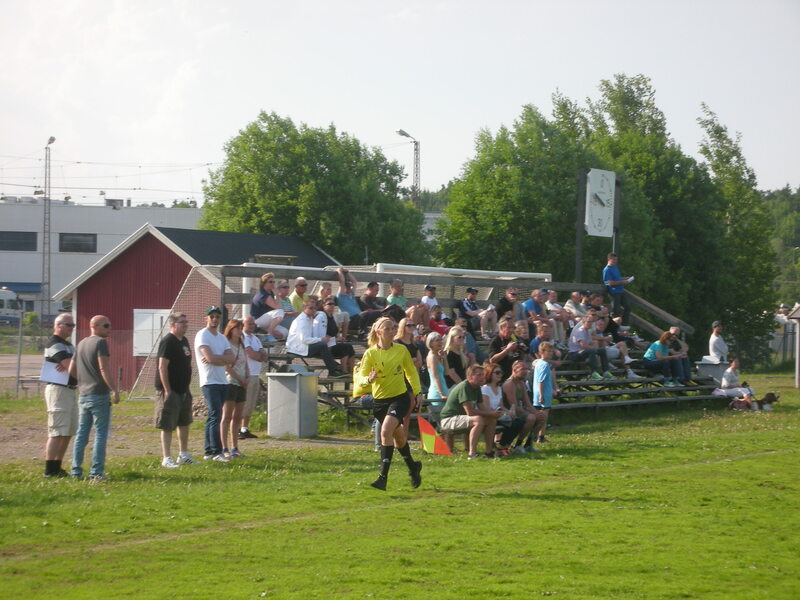 The game finishes in comfortable time to get back to the airport and the seventh annual Swedish Groundhop is done. As usual the event was superbly organised and hugely enjoyable. Voulez-Vous same time next year? Uh huh. Well would be rude not to….